You'll be £36.00 closer to your next £10.00 credit when you purchase German Battlecruisers of World War One. What's this? This is the most comprehensive study yet in the English language of the German Imperial Navy's battlecruisers that served in the First World War. Known as Panzerkreuzer, literally 'armoured cruiser', the eight ships of the class were to be involved in several early North Sea skirmishes before the great pitched battle of Jutland where they inflicted devastating damage on the Royal Navy's battlecruiser fleet. In this new book the author details their design and construction, and traces the full service history of each ship, recounting their actions, largely from first-hand German sources and official documents, many previously unpublished in English. Detailed line drawings and maps augment the text throughout, as do a wealth of contemporary photos that depict the vessels at sea as well as in dock, where details of damage sustained in action and many aspects of their design can be viewed in close up. A superb series of full-colour, specially-commissioned computer graphics show full length profiles and top-down views of each ship in precise and clear detail. This stunning book is a major new contribution to German naval history in this country and will become a 'must-have' volume on the shelves of historians, enthusiasts and modellers and indeed for anyone interested in the navies of the First World War and steel warships in general. 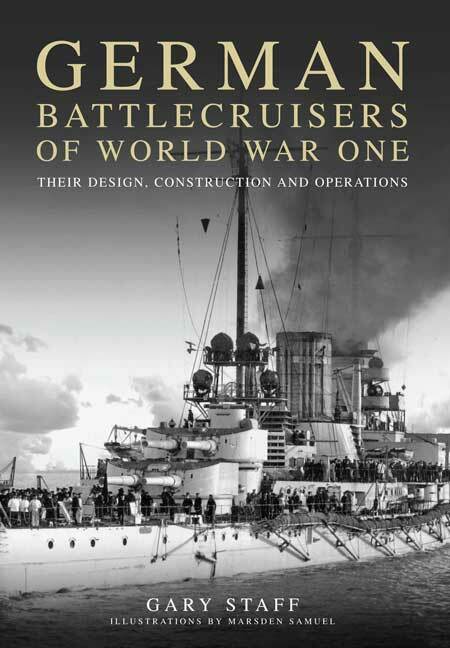 This comprehensive study looks at the design and construction of the eight battlecruisers which served the German Navy during World War 1. A superb series of full-colour, specially-commissioned graphics shows full-length profiles and top-down views of each ship in detail. An immense amount of effort has gone into producing this book which is a mine of information and will remain the fundamental source for these ships for the foreseeable future. The book is produced to the high standard that has come to be expected of Seaforth, beautifully presented with a vast array of detailed illustrations, maps, photographs from the author's own collection and custom-commissioned CAD renders throughout. Print, binding and layout are all excellent. This new study of the German Imperial Navy's battlecruisers, known as Panzerkreuzers, literally 'armoured cruisers', details their design and construction and traces the full history of the seven ships of the type largely from first hand German sources and official documents, many previously unpublished in English. This stunning book, which is the most comprehensive English language study yet published of the German battlecruisers, details the design, construction and service histories of seven ships largely from first-hand German sources... A 'must have' for all those interested in First World War battlecruisers. The book is beautifully produced, excellent value for money and contains much material that has never before been published in English. This lavish, large size book with the detailed individual biographies of the seven German battlecruisers of the First World War has to be the key reference book on this endlessly fascinating subject. This thoroughly absorbing book is extensively illustrated with a huge number of photographs, many newly or rarely seen, plus diagrams, including guns, shells and boats and many detailed ship plans by Marsden Samuel. A master reference book most highly recommended. This new 335 page book is everything you would want form a modeller's point of view - it's packed with photographs and plans of all the German battlecruisers, including those that were not completed or only reached the project stage. All in all, I can't recommend this book highly enough - it's right up there with the like of R.A. Burt and Norman Friedman and you'll have to go a long way to find a better publication.